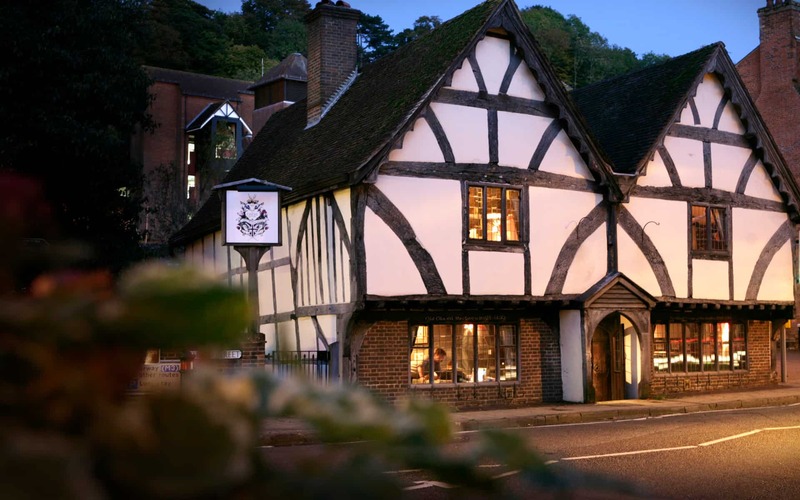 Steeped in history, the medieval Chesil Rectory building is now the oldest commercial property in Winchester. A restaurant for the last 75 years, it was taken over in 2008 by the current team. The city of Winchester has played an important part throughout history. During Saxon times, King Alfred, who was crowned here in 871, made Winchester a royal city: it became the centre of Wessex, the capital of England and subsequently remained a royal residence for many centuries. Built by a wealthy merchant in the Middle Ages, The Chesil Rectory dates back to between 1425-1450, and is one of Winchester’s best preserved Medieval buildings. In fact it is now the oldest commercial property in Winchester. The front of the building is almost all original apart from the windows which would have been simple wooden bars and shutters. The doorway is the original entrance where the livestock and animals would be led through the stone pathway from the front to the back. The fireplaces were a later extension in the 16th Century. Originally simple vents in the roof would have let out the smoke and the walls and roof space would be blackened and the air quality very poor. The building was owned by Henry VIII during the 1500’s when he disbanded many religious buildings in England and Wales, during the ‘dissolution of the monasteries’. He gave the Chesil Rectory to his daughter, Queen Mary, known as Mary Tudor. Queen Mary’s lavish wedding to King Philip of Spain in 1554 at Winchester Cathedral almost bankrupted the city so she bequeathed the Chesil Rectory to the City of Winchester as part payment for the wedding. In the late 1700’s the house was divided into two tenements, with a family living in each side. One family was a shoemaker who, in the large upstairs room, started Winchester’s first Sunday School. In the 1800’s the house gradually deteriorated until it was very nearly demolished. Fortunately it was bought and saved by Thomas and Co stores in 1892 and was thoroughly restored. A one-time merchants house, antique shop, tannery, Bishop’s residence, general store and tea rooms, the building has been a restaurant for the last 50 years.